Divorce is a tough, traumatic experience. It’s especially difficult for children watching their parents fight and split up. Sometimes, however, from this painful experience, siblings in divorce create something positive, using this shared situation to deepen their bond. Part joke, part snark, there is, as Umansky goes on to explain, a current of truth beneath the surface. She recounts how their parents’ divorce, and the subsequent conflict and shuttling back and forth, created a tight, unbreakable bond between her and her brother; one much tighter than normal. They relied on each other to deal with the trauma, and they continue to rely on each other for support. This is a common coping mechanism for siblings in divorce. And one that seems natural—why wouldn’t children lean on those closest to them for support in a time of great stress? While Umansky’s story is anecdotal in nature, many other narratives share striking similarities. Writing in the Huffington Post, Judith Wallerstein, author of the landmark 2001 study, The Unexpected Legacy of Divorce, recounts many parallels tales. Wallerstein interviewed 131 subjects, all siblings who had gone through a divorce, checking in every five years for 25 years following a parental split. In the wake of divorce, kids contend with a variety of pressures, trials, and hardships. There are new living situations, including, but not limited to, new homes, neighborhoods, and even towns. When a parent remarries, blending into stepfamilies poses a challenge. Relocating, even within the same city, often entails switching schools and leaving the familiar behind. All of these elements serve to isolate children. Which is why sibling relationships are often so vital in divorce and child custody scenarios. In rapidly changing circumstances, brothers and sisters are often the one constant to cling to. They’re the only other person who knows exactly what a child is going through because they’re going through the same thing. Wallerstein notes that such turbulent times often strengthened the bond between siblings. And as they aged, many reported those bonds remained intact through the years. Even as the siblings moved into adulthood, went their separate ways, and built their own lives, an unwavering closeness persisted. Through interviews with pairs of now-adult siblings whose parents divorced when they were children, the study looks at how they helped each other cope. Their findings reflect both positive and negative impacts of sibling relationships following divorce. 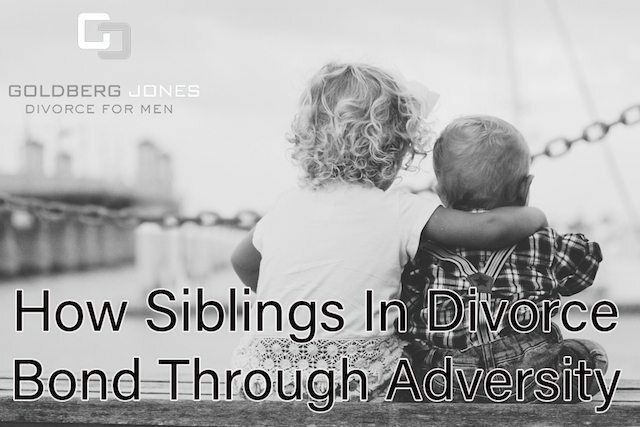 One common theme from the discussions with the participants confirms that the sibling relationship had a positive influence on the individual’s ability to cope with divorce. In these cases, a number of consistent points emerged. Comfort. In many cases, simply having the constant presence of a sibling provided comfort in tough times. The reassurance that they didn’t have to go through this alone eased stress and allowed them to cope better than they would have otherwise. Multiple participants say siblings “saved my life” and similar praise. Stability. In a time of great upheaval, the stability of having a sibling present benefits many children during and after divorce. There’s conflict, shuttling back and forth between houses, step parents, new homes, and much more to contend with. When change is constant, many children cling to any sense of stability. In many cases, the only place to find that is in a brother or sister. Support. One often cited the positive influence of having siblings in divorce was support. In this study, the term support has many meanings. This may mean practical support, like assistance with homework or even a brother helping a sister get into college. It often also denotes something more esoteric, like moral support or simply being around. Caretaking/Protection. Especially in cases when one sibling was older than the other, the respondents frequently cited caretaking and protection as positive impacts of siblings in divorce. Older siblings often helped younger ones understand divorce and what was happening. They guided the younger siblings through tough times and growing up, even shielding them from less-than-rational parents. In many cases, an almost parent-child dynamic developed. Many factors play into this negative swing. In some cases, they caused lasting damage to the relationship between siblings in divorce and for years to come. Parental favoritism. Multiple participants mentioned that parents favoring one child over the other caused strife. Children often act out following a parental split, which sometimes leads to a good kid/bad kid dynamic. Such bias often resulted in increased distance or friction between siblings in divorce. Sometimes this even happened after a period where the kids grew closer but preferential treatment pushed them back apart. Physical separation. Siblings in divorce don’t always wind up living in the same place. Sometimes one child goes with one parent and the other goes with the other. It may be a preference or it may be a court ruling. Either way, physical distance can negatively impact a sibling relationship. One case notes that two sisters having separate bedrooms for the first time in a new house caused this kind of divide. Lack of parental support and communication. It’s a parent’s job to look after their children. Divorce is often so chaotic and overwhelming this falls by the wayside. Though kids may be there for each other, though they may be willing, at such a young age they don’t always have the tools to care for one another. Without a parental model of support and communication, it’s difficult to know what to do. Divorce often leaves a lasting impression on children. Down the road, it can lead to feelings that all relationships, no matter how healthy, are doomed, issues with commitment, and other issues. Siblings in divorce have their own unique experience. Going through a turbulent, emotional time often leads to strong, enduring bonds that last a lifetime, beyond even normal sibling relationships. Since children are so impressionable, as parents, it’s vital to be mindful of how divorce impacts them. You’re going through a tough time, no one denies that. But so are they. Take steps to ensure their health and wellbeing, whether we’re talking siblings or only children. Communicate with them, continue to spend time together, and let them know how important they are. If you have questions about your divorce or child custody case, feel free to contact Goldberg Jones at our San Diego office. I am trying to get information on any statistics, or other information, about multiple siblings in any family that divorce. My ex-husband (ex as in HE divorced me), has three older brothers who also are divorced and got married again. I am curious is there is any information around about this phenomenon. All of them are semi-convservative, etc. Is this a strange, unusual situation? Hi Maria, thanks for reaching out. That’s an interesting question. I passed your contact information on to Zephyr Hill, our managing attorney. He’ll reach out to you soon and hopefully be able to steer you towards the information you’re after. I got this website from my pal who informed me concerning this website and now this time I am browsing this web page and reading very informative posts at this place.